Just because your glass has gone to pieces doesn’t mean you have to! Over 20 years of exceptional service and satisfied customers! Read our reviews here! In cases of minor breakage, a windshield repair – instead of a full replacement – can often restore the integrity of the glass and prevent it from spreading, and improve optical clarity. Affordable Auto Glass is a state of the art glass replacement facillity. We use only the best materials and install to the top industry quality standards to ensure the safest glass replacement. If your side mirror glass is broken and the mirror is still intact, Affordable auto glass has a full selection of side and rearview mirrors avilable. these are direct replacements for the original mirrors. 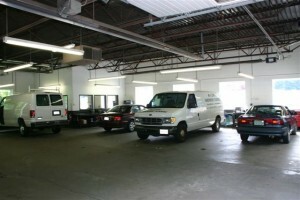 Conveniently located, Affordable Auto Glass is one of the largest repair facilities in western MA. It was extensively renovated in 2001 to include all the features needed to service today’s newer and more complex vehicles. Clean restrooms and a waiting area with television programming are at your disposal. In shop service is our preferred way to service our customers, It provide our installers with a clean safe and predictible enviroment. Weather is never a problem. Front desk personnel VERY personable and couteous. Gentleman who assisted me back to my car also pleasant. Thank you for your service. The CSR was efficient and did an excellent job. He knew his job and didn't waste time. We are very pleased with the results.